What lip kit is this? What lip kit is this? Notice the curvature in the middle. I want it now! Thanks Bebo, you called that one. Super expensive! 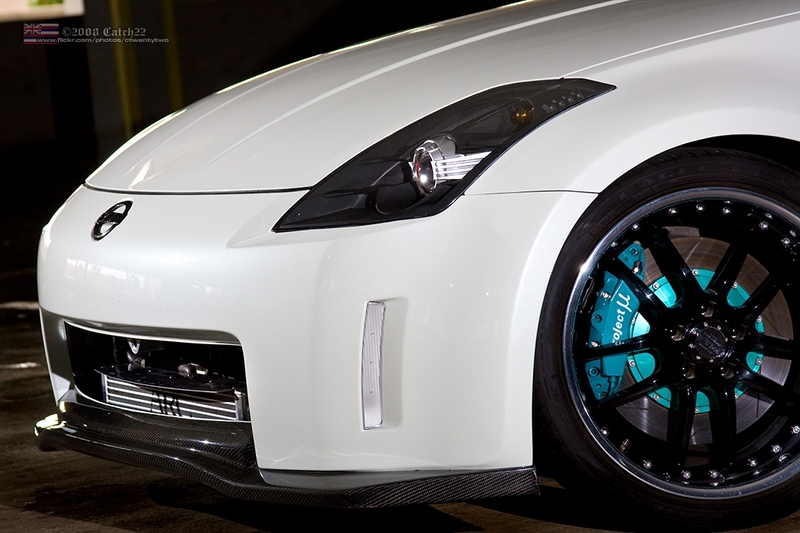 Leemik's Z is so clean! Wow, that is a nice lip and car! do they make replica's of this? Nope. Spent a year trying to hunt down those lips/diffusers... Only one Varis came up in the classifieds over the past year and went for a premium! ^ not really a facepalm. a lip will be the first thing to scrape, and spending a grand on something that is almost certain to get beaten up and damaged is a bad idea. a replica will allow the car to look the same and do the same thing(id anything), but wont make you cry when you scrape. the lip I have now is all scraped to hell. I'm going be a politician and agre with you both. Why spend a grand on something that's gonna get the grunt of most your body damage. Its a waste of good money. On the other hand, Its like shoes-why by nice shoes if you're just gonna walk all over the ground and eventually wear them out? Because I like nice shoes and am willing to pay more. Buy it once, buy it right! Ya damned if you do, and ya damned if you don't! I don't think you read it right. Do it again, but this time read slow and sound out the words. It may help to read a few posts above it. Good luck with it. This does not follow any single one of the 19 rules of inference. You failed logic, now go back to being a cop and stop trying to buy fake merchandise. Aren't you supposed to be arresting people for selling bootlegs instead of trying to buy them for yourself? He has a point... I have/had a TS, Chargespeed, and a VSV1x2 and I've scraped/cracked all but the VSV1. I have a knock off of a Do Luck b/c it's no longer made, so are you going to tell me my set up is crap? Well maybe that's a little different because the authentic Do-Luck is not available at this point as long as u don't go around telling people it's authentic...but lets just flood the market with replicas of EVERYTHING so the real innovators/designers get nothing and go bankrupt. It's ok to have a replica bodykit but not ok to have replica wheels...howcome the same rules don't apply for wheels? LOL.. I have Chargespeed sides, Chargespeed mirrors, V3 Spoiler, 1st Moulding diffuser and a Strafe Do luck rep. So my exterior pieces all together would buy my TE's but it takes a lot less punishment then the TE's too. I literally had my Chargespeed front lip on for 3 days before I had to avoid what looked to be a box in the road and ended up cracking the lip on uneven pavement. Some idiot can come and kick your front lip off(seen it happen) so I would completely understand why some people get reps for daily drivers. I don't like getting reps personally but it's hard to knock on some people especially when they may have a lot of authentic parts. To each is own. Most buy the knock off itmes to save $$, some of us wouldn't dare buy a replica part. Im the later.. I prefer to save my $$ if need be and buy one authentic part. As far as scrapping goes: I hav to be the only person who installs coilovers to raide my car! Bring your lowered cars to NYC and see how long a front li will last! I constantly massage my front lip to make it look mint. Plenty of places I just cant get into due to my car being to low! Authentic vs replica. Great thread.. So many of these knock off companies are destroying the Authentic Manufacturer! Parts from Japan seem to get harder to get, more expensive, or the companies have folded. Quick Reply: What lip kit is this?